Student of Roberto Ardigò, first moral philosophy professor in Palermo, then theoretical philosophy professor in Bologna until 1936. Exponent of the crisis of positivism, he attempted to create a synthesis between naturalistic determinism and the principle of spiritual freedom. 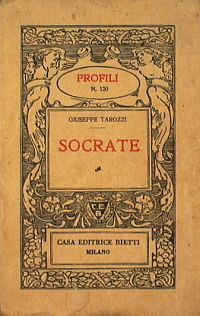 Main works: Apologia del positivismo (Roma 1928); La ricerca filosofica e la religione (s.l. s.d., ma 1935); La libertà umana e la critica del determinismo (Bologna 1937). Bibliography: E. Garin, Cronache di filosofia italiana: 1900/1943, Bari, Laterza 1955. The collection, donated by his wife Angela Romagnoli Tarozzi to the library of the University of Florence, is divided between the library of the Faculty of Education, which has the largest part (1,797 volumes) and the Faculty of Letters (311 volumes and 607 pamphlets, part of which are still to be inventoried and catalogued). There is the original inventory of the volumes kept in the Faculty of Letters, while those deposited in the Faculty of Education were inventoried in 1985. The books are mostly of the 19th and 20th centuries.